Not many people think of garages as a fire hazard, but with the potential of a car fire and the storage of hazardous materials (ex: gasoline and fertilizers) it can be a recipe for a disaster. For this reason, current building standards require at least a “one hour” fire wall or barrier between the living space and an attached garage. Materials like doors and gypsum board (a.k.a. drywall) have a fire rating which should have a minimum 1 hour. This barrier is intended to help contain a fire so people can escape the building and the fire department can respond to the fire. Garage Walls: ½” inch or more drywall should be installed from floor to the ceiling between the garage and living space. 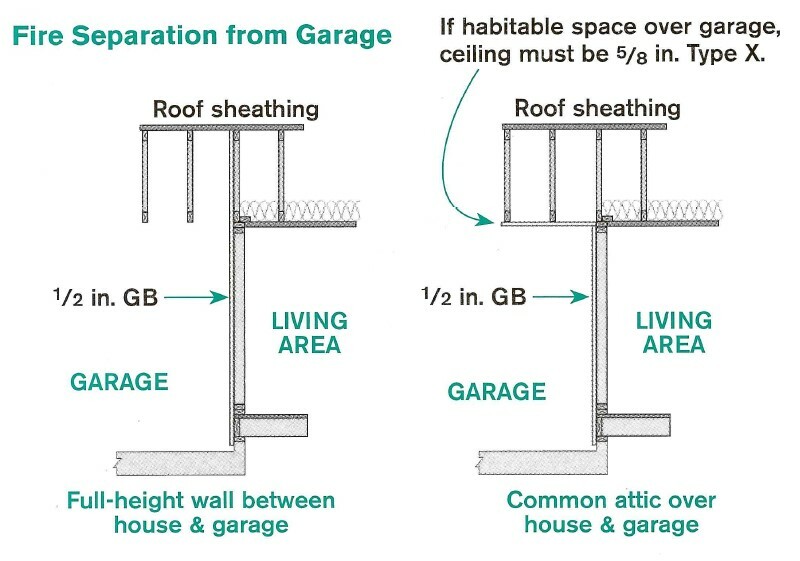 Garage Ceiling: When there is a living space above the garage, the drywall thickness needs to be increased to 5/8” inch drywall Type X. All openings (ex: pipes, ducts, wires) should be sealed with a fire blocking material. 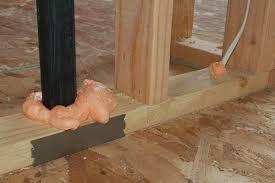 Usually this material is orange colored foam.